Water being the most vital element of our life, its purity should be accorded the highest priority by each of us. Water is our Life Line. Many diseases in the third world are either water-borne or due to contaminated water. Unlike the western countries where tap water is safe for drinking, the water that comes through taps in the developing world is unfit for drinking. Every household thus requires a water purification system. With the market being flooded with water purifiers each promising the purest drinking water, it’s tough to select one. Unlike any other appliance the purchase of a water purifier requires much more deliberation because it involves the health and safety of you and your family. The most important factors to consider is the quality of water, filter type and purification method. Our guide will help you to select a purifier which is the best for you and your family so that you don’t compromise with the health of your loved ones. Water is purified by any one or a combination of the following methods. 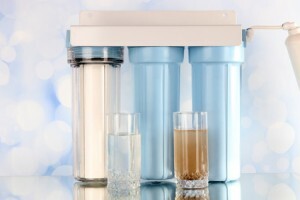 Pre-filtration: Prior to main filtration, the water is made to go through a pre-filter. The design of pre-filters is such that it removes dust, silt and sediments from the water. A pre-filter is rated by the size of particles (expressed in microns)it can eliminate. Sediment filtration: It uses the principle of gravity for filtration. When water passes through the filter, suspended particles get trapped onto the surface of the filter. Used for pre filtration In RO filters. It requires regular filter replacement. Activated Carbon filtration (AC): Carbon granules or blocks are charged with silver molecules. When water passes through this filter, impurities are trapped in the pores of the filter. The particle size that the filter can trap is specified in the filter description. How it works: water pressure forces water molecules through a semi permeable membrane having extremely tiny pores of a certain size(measured in microns). Many membranes are rolled together to form a cylinder. Solutes smaller than membrane size pass through it and the larger ones are held back. If the water pressure is low, RO does not work. It cannot treat biologically unsafe water. Ultraviolet Filtration(UV): This is a disinfection method. How it works: The water goes into a cylindrical chamber which has a UV lamp. The pathogens when exposed to the UV rays from all sides, are deactivated or killed. Eliminates almost all harmful bacteria, virus and microorganisms. Energy consumption is less than 60watt bulb. How it works: It’s a membrane filtration which uses the principle of size exclusion. Only water and solutes of very low molecular weight pass through. It is generally used in Pre/post filtration. In futuristic purifiers, microfiltration and nano filtration are being used as pre filters. For the best quality of drinking water, modern purifiers filter water through couple of stages where a combination of the different filtration methods is adopted. Color, odor and taste; Dissolved chemicals like chlorine; Organic matter. Total Dissolved Salts are high. Water purifiers are available in both electric and non-electric modes. Use Sediments filters and Activated Carbon filters for pre filtration. Water Quality: Asses the quality of water and accordingly choose a filter which can purify it the best. Electric/ Non-electric: If the place you live in has erratic power supply then you may consider an RO purifier or a UV with storage. Storage: Not all purifiers have storage option. If you wish to collect purified water or your locality has power supply issues, you should opt for a storage type. The capacity of the storage tank may be an important factor too. Purification technique: Each purification method has its limitations in eliminating all the impurities present in the water. Different purifiers use different methods of purification. Depending upon the type of water, impurities and contaminants the purification method has to be chosen accordingly. Modern purifiers use two or more purification technique to ensure better quality of water. Stages of purification: No single technique of purification works good so water is purified in stages. Each stage uses a different purification technique. More the number of stages more cleaner the water. Quality of purification: Purified water should be potable, odor free and free from all hazardous elements. Quality of material used: The material should be food grade, non-toxic, rust proof and durable. Aluminum reacts with salts and minerals and poses health hazardous. ABS plastics are testified. TDS: Water has some elements essential for our body. During purification process these are also eliminated completely at times. Some purifiers have TDS management where the essential minerals and salts are retained. TDS control adds the minerals at the last stage of purification. Capacity: It’s the quantity of pure water the filter can purify in an Hour(L/hr). Maximum duty cycle: Maximum water that can be purified in a day. Purification capacity(life of the filter): is the total quantity of water it can purify. A filter change is recommended after that. Wall mounting: You can choose from over the counter or wall mounting. Some purifiers have both the option. Annual Maintenance Contract(AMC): The filters need replacement after their life or time period. Its better if you opt for the AMC. Auto shut off : Once the storage tank is filled up, the auto cut off valve cuts off the water inflow into the RO purifier. Purity indicators: shows the purity of input and output water. Voice Alerts: Alert for UV fail and filter change etc. If not changed then the purifier does not function ensuring the safety of your family. Auto-Flushing System: The filter membrane is flushed and cleaned automatically. This enhances the life of the filter. Hot & Cold Water: advanced purifiers come with this options with the program on touch panel. Product Certifications It provide assurance that the products have been rigorously tested and comply with all the requirements of the testing standards. 1. 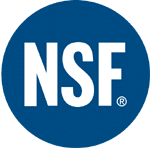 NSF(National Sanitation Foundation): It is your key to making sure that the products you use meet strict standards for public health and safety . Choosing a product certified by NSF lets you know the company complies with strict standards and procedures imposed by NSF. Products that meet these standards bear the NSF mark. 2. EPA the United States Environmental Protection Agency(US EPA)has set standards for Maximum Contaminant Levels (MCLs) for drinking water The USEPA criterion for reduction of viruses is 4.0 log. This means that if there are 10,000 particles in the water that is going to be processed, there should be no viral particles in the water after purification. WQA WQA’s Gold Seal Product Certification for water treatment ensures that the product is constructed from safe materials, the claims listed on the packaging are backed by test data, and the product will hold up under normal usage conditions. In India, with the topographical differences, the type of water available for drinking in different parts of the country is different. Moreover, the surroundings (Industries, factories, etc) of the water supply also heavily impact the level and type of impurities. It is advisable to test the water for its quality before buying the purifier. This is a very amazing and nice post. I have to tell you there is best water purifier company in India which give the good and trusted products with best service. Thanks fro appreciating our post. Hope you keep using our website. Please mail us on info@conzumr.com to inform more about it. Thanks for the appreciation. Hope you will keep using the site and providing feedbacks. Glad you like it. Thanks for using the website and providing your feedback.